NASA's Curiosity rover is in the midst of a four-day brain transplant that will give it the smarts to drive around, use its robotic arm and do all the things it's expected to do over the months and years to come. The reprogramming marks the transition from Curiosity's space odyssey to its scientific mission. The old software, which helped Curiosity get through its "seven minutes of terror" and land safely, is being phased out. The new software is being phased in — first on the primary computer, and then on the backup computer. During the process, science is taking a back seat. The switchover is required because of the limitations of Curiosity's onboard memory. There are only about 4 gigabytes available for data storage, said Ben Cichy, the mission's lead flight software engineer. When Cichy described the limitations during a briefing today at NASA's Jet Propulsion Laboratory in Pasadena, Calif., he made a joking reference to Curiosity teammate Bobak Ferdowsi, the "Mohawk Guy" who stirred up so much Internet buzz this week (and was sitting in the audience during today's briefing). "My phone has a processor that's 10 times as fast as the processor on Curiosity," Cichy said. "It has 16 times as much storage as Curiosity has, and my phone doesn't have to land anything on Mars. All my phone has to do is follow Bobak's Twitter feed." The memory limitation comes into play because the rover's hardware had to be certified as capable of standing up to the rigors of space radiation. At the time that the rover was designed and built, going back as far as eight years, Curiosity's computer firepower was considered the state of the art in radiation-hardened electronics. Fortunately, Cichy said, JPL has a "lot of very, very talented software engineers" who could work out a system for uploading fresh software into the rover's memory during the eight-month-plus flight from Earth, and installing it while Curiosity is sitting inside Gale Crater on Mars. "When they're given a challenge, they solve it," he said. The new software, known as R10, gives Curiosity the capability to move its 7-foot-long (2.1-meter-long) robotic arm and use all of its sampling devices, including a drill and a dust removal tool. It also upgrades the six-wheeled, nuclear-powered rover's driving smarts, so that it'll recognize obstacles autonomously and drive around them. That will be a key capability, considering that there's a 14-minute delay in communications between Earth and Mars due to the speed-of-light travel time. Past rovers were occasionally stymied because they encountered an obstacle and had to wait for instructions from Earth. "Curiosity was born to drive," Cichy said. "So the R10 software includes the capability for Curiosity to really get out and stretch her wheels on the surface of Mars." 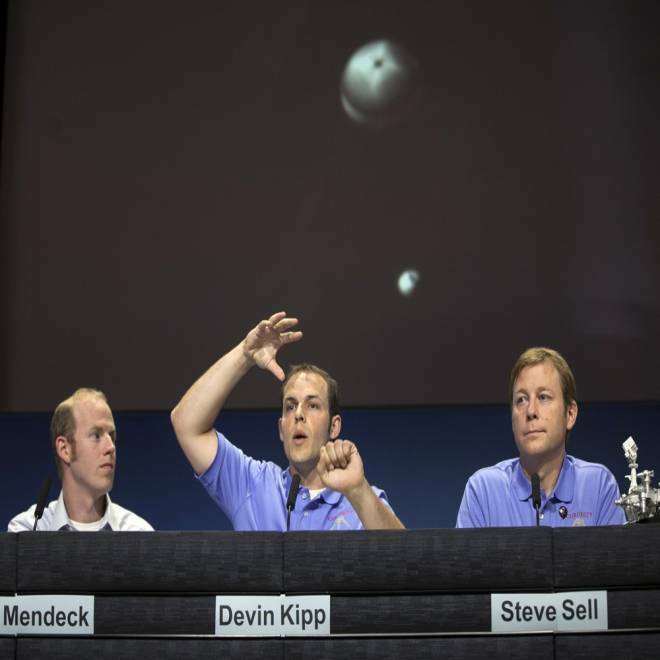 Devin Kipp, a member of the entry, descent and landing team for the Curiosity rover mission, gestures while teammates Gavin Mendeck (left) and Steve Sell (right) look on. Kipp said the picture of the spacecraft's working parachute, seen on the screen behind him, was "about the most beautiful picture I've seen in my life." During the four-day reprogramming operation, Curiosity's science team will be analyzing the images that the rover took of its surroundings at Gale Crater and deciding what the next steps should be. Depending on how the operation goes, Curiosity's science checkout could resume on Tuesday. 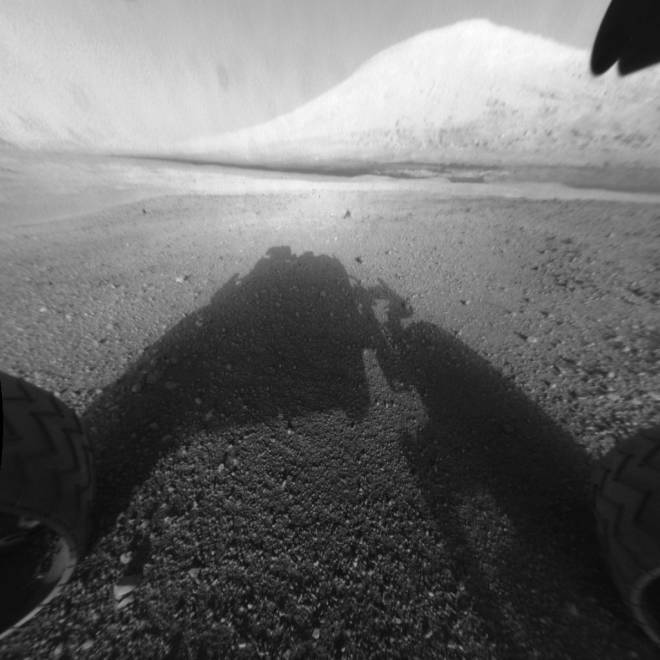 However, software transitions can be tricky: Shortly after the Spirit rover landed in 2004, a computer glitch took it out of action for two weeks. Fortunately, that rover recovered and went on to send back five years of scientific observations from Gusev Crater. Opportunity, Spirit's twin, is still going strong at Endeavour Crater, half a world away. Scientists are hoping for even more from the larger and more capable Curiosity rover. The goals of its two-year, $2.5 billion mission are to analyze billions of years' worth of geological history contained in the rock layers of a 3-mile-high (5-kilometer-high) mountain known as Aeolis Mons or Mount Sharp, and to look for the chemical signs of potential habitability. Although Curiosity isn't designed to detect life directly, its findings could point the way for future life-detection missions. • The engineers on Curiosity's team for entry, descent and landing — or EDL for short — recapped the story behind Curiosity's seven minutes of terror. Guidance lead Gavin Mendeck reported that the Mars Science Laboratory spacecraft weathered accelerations of up to 11 G's during the descent. "If you were a human on board ... it would be a rough ride," he said. The rover landed about a mile and a half downrange of the central aim point, probably due to tail winds and a last-minute maneuver, Mendeck said. "We're still happy where we landed," he said. A more detailed review will be conducted once all of the EDL data is downloaded. • The mission's project scientist, John Grotzinger, explained why the map quadrangle where Curiosity landed was nicknamed Yellowknife, after the capital of Canada's Northwest Territories. "If you ask what is the port of call that you leave from to go on the great missions of geological mapping to the oldest rocks in North America, it's Yellowknife," he said. Similarly, Curiosity will drive off from its landing site to study what may be some of the oldest rocks on the Red Planet. "It's sort of a tradition that was started here on Earth, and we're trying to do it on Mars," Grotzinger said. • Curiosity team member Allen Chen said it was a good thing that NASA delayed the launch of Mars Science Laboratory by two years, even though that added hundreds of millions of dollars to the mission cost. "We weren't ready in 2009," he said. "Having that extra time certainly gave us the opportunity to make sure everything was going to work right. The proof is in the pudding." • The team members said they were gratified by the public response to the mission, but one of the engineers, Devin Kipp, said the "enormous feeling of accomplishment" tasted even sweeter than fame. All of them were clearly taking the public adulation in stride. "I got recognized in the pizza parlor ... that was a little weird for me," Chen joked. • We featured Curiosity's picture of Mount Sharp as the subject of our "Where in the Cosmos" picture puzzle today on the Cosmic Log Facebook page, and it took mere seconds for Joe Chmill Jr. to tell us that Aeolis Mons is the alternate name for the mountain. (Aeolis Mons is actually the name that's recognized by the International Astronomical Union. Mount Sharp is an unofficial moniker.) To reward Chmill's quick wits and fast fingers, we're sending him a pair of 3-D glasses, as well as red-blue renderings of Aeolis Mons and yours truly. Several runners-up are also eligible to receive 3-D glasses: AZ Ducky, John Mulligan and Ken Mullins. Click the "like" button for the Cosmic Log Facebook page and limber up your typing fingers for next Friday's contest.